Episode 5.21 “Fly into a Rage, Make a Bad Landing” — “When Detective Bell’s girlfriend, Chantal (Chasten Harmon), is assaulted and her ex-husband is killed soon after, in what Holmes and Watson discover is a staged suicide, they search for one suspect behind the linked crimes. Also, as Bell fights the urge to seek his own brand of justice for Chantal, Sherlock makes a heartbreaking realization about the detective’s past. Air Date: Sunday, April 30 (10:00-11:00 PM, ET/PT) on CBS. 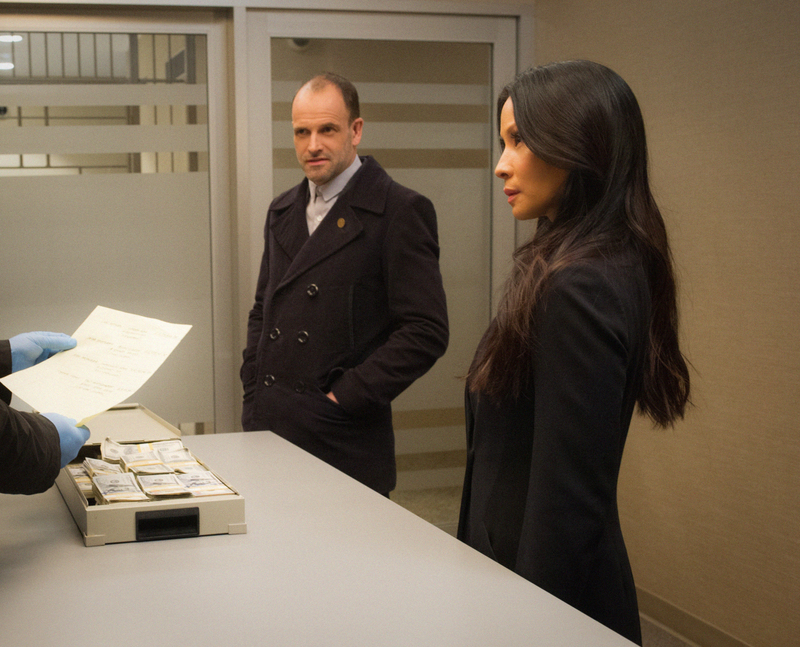 Elementary stars Jonny Lee Miller as detective Sherlock Holmes and Lucy Liu as Dr. Joan Watson in a modern-day drama about a crime-solving duo that cracks the NYPD’s most impossible cases. Initially sober companion and client, their relationship evolved into a symbiotic professional investigative partnership. Holmes and Watson are the top homicide consultants for Captain Thomas Gregson and work regularly alongside Detective Marcus Bell, but their status with the force is revoked when Holmes assaults a former associate and suffers a relapse. Facing professional uncertainty, Sherlock and Joan are shocked by the arrival of Morland Holmes, Sherlock’s estranged father. Morland orchestrates Sherlock and Joan’s reinstatement to the NYPD, but his ongoing presence in New York brings unsettling family secrets to the surface. While Sherlock reels from the revelation that his deceased mother was also an addict, Joan endures a family bombshell of her own when she learns of a younger half-sister she never knew existed. When Sherlock, Joan and Morland form a tenuous alliance to find the perpetrator behind an assassination attempt on Morland’s life, they uncover a clandestine international crime organization once run by Sherlock’s former lover and nemesis, Moriarty. To save himself and Sherlock, Morland makes a secret power play that leaves him as the new head of the nefarious organization, and departs for London with plans to dismantle the syndicate from within. In season 5, Sherlock and Joan take on a new protege, former convict Shinwell Johnson (who first showed up in Arthur Conan Doyle’s 1924 Sherlock Holmes story “The Illustrious Client.”). Shinwell is a reformed drug dealer who has ambitions to dismantle the gang he once operated in. However Shinwell’s methods, coupled with emerging unsavory details about his past often prove a sticking point for both Sherlock and Joan. ELEMENTARY "Fly into a Rage, Make a Bad Landing"